This article is about Dranas Lerano. For Dranas Llethro, see Dranas Llethro. 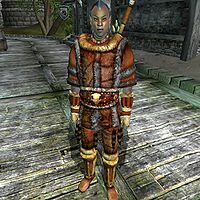 Dranas Lerano is a Dunmer rogue, and a former employee at Lelles' Quality Merchandise. Along with his companions, Aenvir and Storn the Burly, he has been robbing Lelles' store on a regular basis for a while, and the Fighters Guild has been hired to put a stop to it. He does not exist in the game until you talk to Norbert Lelles about the break-ins. After that, he loiters outside the shop until it's time to break in, which is between 10pm and 4am. Dranas is equipped with a leveled light cuirass and boots. He has a 50% chance of having gauntlets, greaves and a helmet, all of which are leveled light armor . He is armed with a leveled claymore and holds a set of lower-class clothing: a shirt with suspenders, breeches and a pair of clogs. He also carries the key to Lelles' Quality Merchandise, which will be removed when he enters the store and a small amount of gold. He knows a leveled set of rogue spells. Norbert will be quite surprised when you tell him Dranas was among the thieves: "You've gotten them? Wonderful! But... their names are familiar to me. All of those men have worked for me! Amazing. I even trusted them to open up the shop in the mornings. I can't imagine what turned them to a life of crime." This page was last modified on 12 July 2018, at 16:18.